Postseason eligibility is at stake in Sunday’s Bank of America Roval 400 (2 p.m. ET, NBC, PRN, SiriusXM), the final race in the opening round of the Monster Energy Series Playoffs. 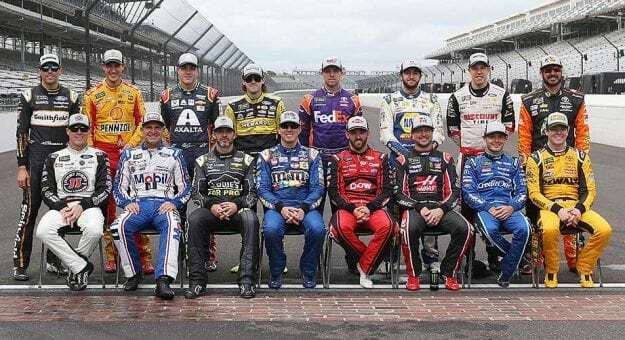 The postseason field will be whittled from 16 drivers to 12 after the debut event on Charlotte Motor Speedway’s combination oval/road course. Only three drivers have clinched automatic berths in the Round of 12: Brad Keselowski and Kyle Busch, on the basis of their wins earlier in the round, and Martin Truex Jr., by virtue of his buffer in the series’ points standings. Joey Logano – If there is a new winner, Logano will clinch with 33 points. If there is a repeat winner (or a win by Martin Truex Jr., Kevin Harvick, Aric Almirola, Kyle Larson, Kurt Busch, Chase Elliott, Austin Dillon or Alex Bowman), Logano would clinch with 30 points. If Ryan Blaney wins, Logano would clinch with 31 points. Aric Almirola – If there is a new winner, Almirola would clinch with 35 points. If there is a repeat winner (or a win by Martin Truex Jr., Kevin Harvick, Joey Logano, Kyle Larson, Kurt Busch, Chase Elliott, Austin Dillon or Alex Bowman), they would clinch on points with 32 points. If Ryan Blaney wins, Almirola would clinch with 33 points. Kyle Larson – If there is a new winner, Larson would clinch on points with 40 points. If there is a repeat winner (or a win by Martin Truex Jr., Kevin Harvick, Joey Logano, Aric Almirola, Kurt Busch, Chase Elliott, Austin Dillon or Alex Bowman), Larson would clinch with 37 points. If Ryan Blaney wins, Larson would clinch with 38 points. Kurt Busch – If there is a new winner, Busch would clinch on points with 43 points. If there is a repeat winner (or a win by Martin Truex Jr., Kevin Harvick, Joey Logano, Aric Almirola, Kyle Larson, Chase Elliott, Austin Dillon or Alex Bowman), Busch would clinch with 40 points. If Ryan Blaney wins, Larson would clinch with 41 points. Chase Elliott – If there is a new winner, Elliott would clinch with 48 points and a new winner. If there is a repeat winner (or a win by Martin Truex Jr., Kevin Harvick, Joey Logano, Aric Almirola, Kyle Larson, Kurt Busch, Austin Dillon or Alex Bowman), Elliott would clinch on points with 45 points. If Ryan Blaney wins, Elliott clinch with 46 points. Austin Dillon – If there is a new winner, Dillon would clinch with 48 points. If there is a repeat winner (or a win by Martin Truex Jr., Kevin Harvick, Joey Logano, Aric Almirola, Kyle Larson, Kurt Busch, Chase Elliott or Alex Bowman), Dillon would clinch with 45 points. If Ryan Blaney wins, Dillon would clinch with 46 points. Alex Bowman – If there is a new winner, Bowman would clinch with 53 points. If there is a repeat winner (or a win by Martin Truex Jr., Kevin Harvick, Joey Logano, Aric Almirola, Kyle Larson, Kurt Busch, Chase Elliott or Austin Dillon), Bowman would clinch on points with 50 points. If Ryan Blaney wins, Bowman would clinch with 51 points. Ryan Blaney – If there is a new winner, Blaney would clinch with 54 points. If there is a repeat winner (or a win by Martin Truex Jr., Kevin Harvick, Joey Logano, Aric Almirola, Kyle Larson, Kurt Busch, Chase Elliott or Austin Dillon), Blaney would clinch with 51 points. If Alex Bowman wins, Blaney would clinch with 52 points. Clint Bowyer – If there is a repeat winner (or a win by Martin Truex Jr., Kevin Harvick, Joey Logano, Aric Almirola, Kyle Larson, Kurt Busch, Chase Elliott or Austin Dillon), Bowyer would clinch with 55 points. With a win, Bowyer would clinch a next round spot. Bowyer could clinch on points with a new winner and help.